ON FARM ACTIVITIES WHAT'S IN SEASON? Our beekeeping operation began in the 1950's when Henry Foote started keeping a few hives of bees for pollination of the apple orchards. The operation today has four hundred hives of bees, a honey extraction and packing plant. Our honey is non-pasturized and contains no preservatives. 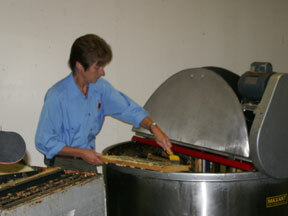 In addition to our liquid honey, we manufacture creamed honey as well as cut comb. Honey is packaged in a variety of containers, from 500g bottles all the way up to 60-pound pails. Buyers can purchase any amount they desire, from single bottles to case lots. Honey also is available in bulk, so anyone can bring their own containers and have them filled. Depending on the season, different types of honey are available, including blueberry, clover and wildflower. If you visit the farm store in the fall, you can see the process of collecting the honey as it is being removed in the honey room with the extractors.